NOTE: I had hoped to illustrate these movie reviews with lots of screen grabs, to make them match my TV season reviews, but my optical drive has failed me, so instead I'll make do with promotional material. Hopefully I'll have a chance to go back and add screen images in the future. 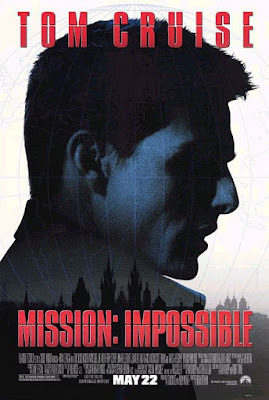 If one can manage to ignore the Phelps issue, however, Mission: Impossible is a highly entertaining movie, and a very rewarding one for spy fans. De Palma, who manages to be divisive even among his admirers (personally I find I tend to either love or hate his films), is, like Quentin Tarantino, a master of reappropriation. While he’s been accused of outright theft, I think that’s unfair. He takes scenes and situations he admires from classic films (and not little known ones, either; he blatantly borrows well-known imagery from the likes of Hitchcock, Antonioni, Kubrick, Coppola, and Eisenstein, among many others), and crafts them into something new, audacious, and often spectacular. He doesn’t just take imagery from these masters; he’s also studied their craft, and on a good day is right up there with Argento and Scorsese in his ability to construct epic cinematic setpieces worthy of Hitchcock. 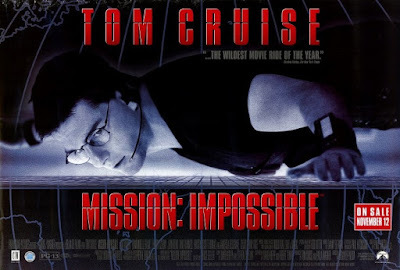 Mission: Impossible may owe its title, basic premise, and (most crucially) its theme music to its namesake television program, but the plot and central setpiece come from other spy and heist movies to which the director wishes to pay homage. And that makes it tremendous fun for fans of those genres. But despite the unforgiveable treatment of Jim Phelps, De Palma also pays homage to Bruce Gellar’s series. Before that deconstruction comes, though, we’re treated to one more moment of pure, classic television Mission as the main titles unfold in a very familiar way to very familiar music. The TV series was somewhat unusual in cutting a new, unique opening credits montage for each episode, which teased actual scenes from the show you were about to watch with familiar graphics of a lit fuse burning down. 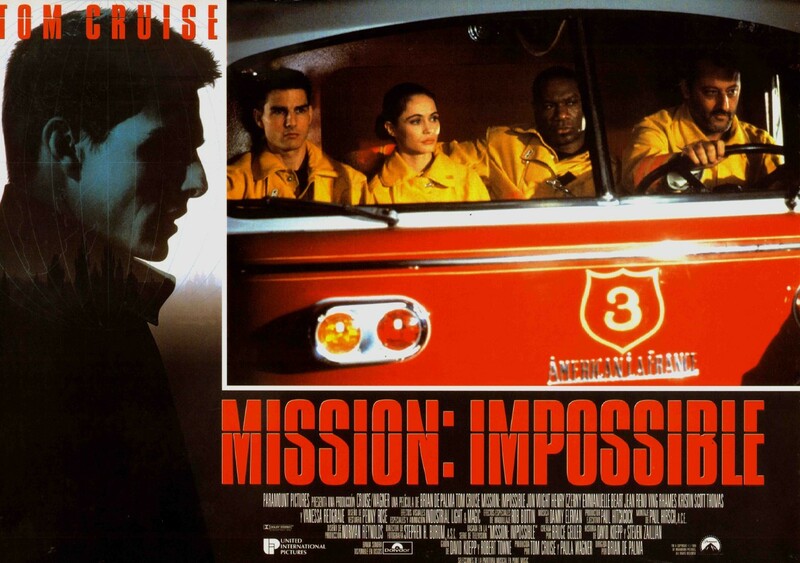 De Palma crafts the same sort of opening for his film, showing bits and pieces of the movie to come set to composer Danny Elfman’s version of Lalo Schifrin’s iconic Mission: Impossible theme music. Following the titles we’re treated to yet another familiar trope from the TV show, as Jim Phelps (Voight) is issued his orders via a recording hidden in an innocuous everyday item. (In this case it’s a personalized in-flight film selection, proffered by the complicit stewardess.) The voice is not Bob Johnson’s, but many of the phrases are: “Good morning, Jim…” “Your mission, should you choose to accept it…” and “This tape will self-destruct in five seconds.” We know the drill! From there, however, De Palma and screenwriters David Koepp (Jack Ryan: Shadow Recruit), Steven Zaillian (Clear and Present Danger) and Robert Towne (who penned one of the greatest Man from U.N.C.L.E. episode "The Dove Affair" before going on to write such classics as Chinatown) serve up what the comfortably formulaic TV series never really gave us: an IMF mission gone horribly, deadly wrong. 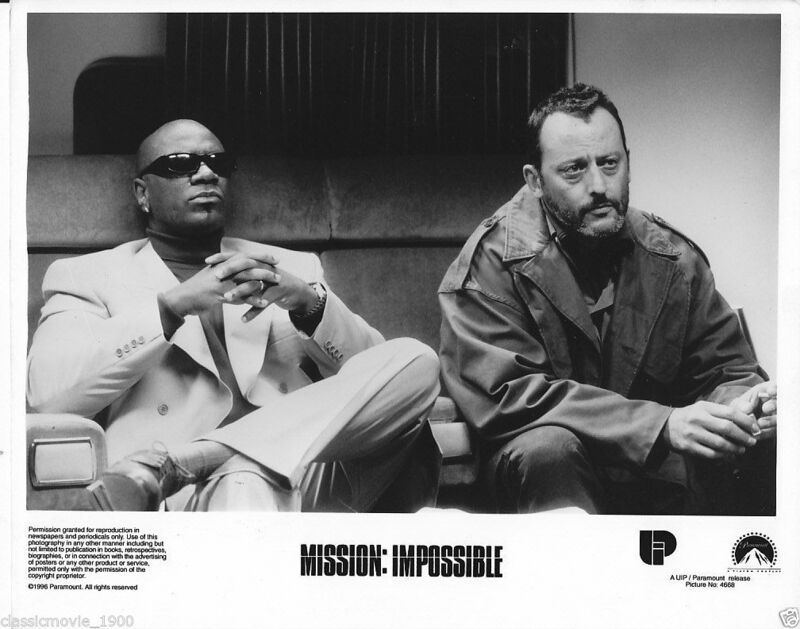 The team (played in an act of calculated misdirection by recognizable actors who had been heavily played up in commercials and even “introduced” in a comic book promising fans their first look at the new IMF) is tasked with infiltrating a black tie embassy party in Prague, and securing a MacGuffin from a traitor named Golitsyn. (Yes, De Palma happily references real life spies as well as fictional ones.) It seems like a simple enough assignment for team members with familiar specialties, like electronics wiz Jack (Emilio Estevez), icy femme fatale Sarah (Kristin Scott Thomas, deliciously channeling Barbara Bain) and master of disguise “point man” Ethan Hunt (Tom Cruise), among others. And it goes smoothly enough at first, but then, shockingly, team members start dying in grisly ways. Jim calls abort, but Ethan desperately tries to salvage the mission, only to end up impotently watching as all of his colleagues are killed, one by one, before his eyes. This includes Jim, who appears to be shot at point blank range and then fall off a bridge, and Jim’s wife, the beautiful Claire (Emmanuel Beart), whose car explodes. De Palma has given fans exactly what they want, and then pulled the rug out from under them quite excitingly. And he just keeps on tugging that rug when, later on, Jim is revealed to be still alive, and the architect of his own team’s demise. (Claire has also survived.) 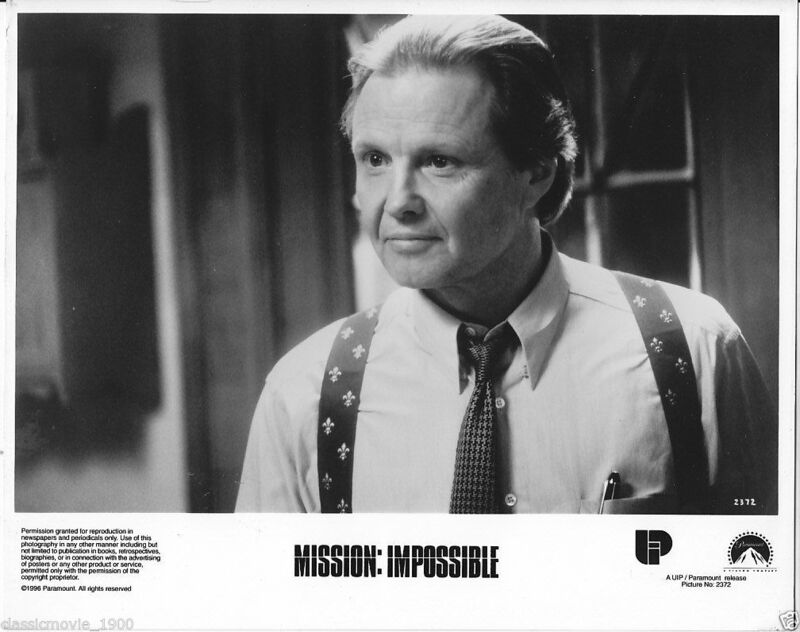 It’s classic Mission: Impossible… thoroughly and brutally deconstructed. But even if the plot is pure Hitchcock (by way of Condor), De Palma’s most famous appropriation (and the defining scene of the film in most viewers’ minds) comes from Jules Dassin’s 1964 heist classic Topkapi (based on Eric Ambler’s novel The Light of Day, and also an influence on Geller) in the form of a tour de force heist of CIA headquarters involving Ethan memorably dangling from the ceiling into a pressure-sensitive, climate-controlled vault. To aid him in this impossible mission, Ethan ends up forming the basis of a new team by recruiting disavowed agents Luther Strickle (Ving Rhames, then riding high on his breakout Pulp Fiction performance) and Krieger (Jean Reno, fresh from his international star-making turns for Luc Besson in Nikita and Leon) to join himself and Claire. Luther is a computer hacker in the vein of the original series’ tech whiz Barney Collier (Greg Morris), and Krieger is an all-purpose tough guy who flies helicopters and likes knifing people. 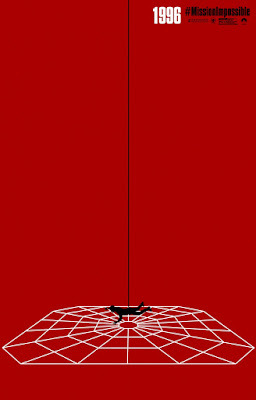 The role as scripted seems to call for more of a Peter Lupus-type strongman (Willy on the TV show), as Krieger’s main function on the CIA heist is to deploy the rope from which Ethan dangles and to haul him back up (indeed, Krieger was drawn as a hulking muscle man in the Marvel prequel comic… but then again artist Rob Liefeld didn’t know how to draw men any other way), but Reno was the flavor of the moment and more than capable of a convincingly evil turn when the script calls for it. While not part of the de facto team, Vanessa Redgrave (Blow-Up) also deserves mention for a scene-stealing turn as an arms dealer named Max with a fascination for paradoxes and a seeming affinity for Ethan… if not trust. And she’s aided by Necros from The Living Daylights, actor Andreas Wisniewski, who makes the most of a small part with a large presence. Like his “Odessa Steps” sequence copped from Battleship Potemkin in The Untouchables (a very high quality adaptation of a classic TV show), De Palma’s vault heist is an excellent example of how he masterfully reappropriates iconic scenes and makes them work in new contexts. The scene shows off Cruise’s trademark acumen for physical stuntwork (the dangle might not be from the heights of the Burj Khalifa or an airborne transport plane, but the acrobatics involved in remaining stiff as a board, parallel to the floor are very impressive—and clearly required abs of steel!) along with De Palma’s ability to craft ever-building suspense. Taking a page from another classic Dassin heist, in Rififi (1955), the whole enterprise must unfold in silence because alarms will go off if Ethan makes any sound. So the sequence plays out purely visually and generally free of dialogue. After cleverly establishing the elaborate rules of the room via pre-lap voiceover as Cruise briefs his compatriots in advance, De Palma is able to ratchet up the tension with a close-up of a bead of sweat rolling down Ethan’s glasses from his forehead (will it hit the floor, setting off the alarms???) or a shot of a rat approaching Krieger as he lowers Ethan from the air vents above (will he sneeze again, setting off the alarms, or lose his grip on Ethan???). The director moves skillfully from wide shots establishing Ethan’s place in the space of this carefully controlled environment to close-ups of things like that bead of sweat or digital countdowns to create a nail-biting sequence. And true to the tenets of reappropriation rather than rip-off, everything taken from Dassin plays out within the context, once again, of a classic Geller IMF set-up. 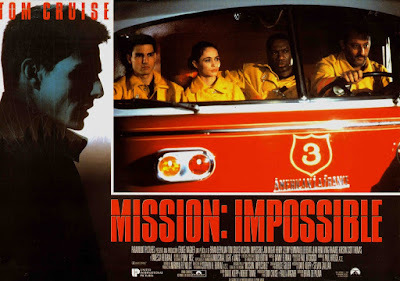 While the movie as a whole relies too heavily on a single protagonist for fans of the very much team-based series, the individual setpieces tend to highlight classic Mission: Impossible teamwork. Every member plays a role in the events at CIA headquarters, from Claire drugging the coffee of the man who’s meant to occupy the vault they’re invading, to Luther in the van looking at screens with moving green dots (as in Alien, these dots also signify suspense within the context of the scene) to Krieger struggling with Ethan’s weight on the other end of his rope. And upon executing their plan, they all make their getaway dressed as firefighters (recalling the show's first season episode "Memory") to the familiar strains of Lalo Schifrin’s original series cue “The Plot,” as reimagined by Danny Elfman. While utilizing generous bits of Schifrin throughout, Elfman’s terrific score also reinforces De Palma’s Hitchcock influence by channeling Bernard Herrman in equal measure. Furthermore, the timeless score helps the movie feel less dated today than its contemporary, GoldenEye, whose Eric Serra score places it as instantly and precisely in 1995 as the computer technology on display. The only setpiece where De Palma really falters is in the final one, a chase atop the TGV train that involves a helicopter chasing the high-speed train into a tunnel. This sequence was heavily showcased in the film’s original advertising campaign, but even despite the great score it does feel a bit dated today thanks to the very sort of CGI the series now does its best to avoid (in favor of practical stunts), but which was such an irresistible new tool at the time that everyone was using it… even though the technology was still far from perfected. But unlike many of the subsequent movies in the film franchise, the action setpiece was not the film’s real climax. The complicated spy plot of betrayals and reversals plays out dramatically on board the train (such a classic genre setting!) prior to the wind tunnel flips and fighting. And, once again, it involves sleight of hand, both physically and in the filmmaking. De Palma relishes his reveals, and deploys them in his unfailingly cinematic style, with Cruise envisioning different scenarios that play out visually for the audience and in his head while verbally describing something entirely different for the benefit of his on-screen audience—a trick Christopher McQuarrie would revisit decades later in the series. 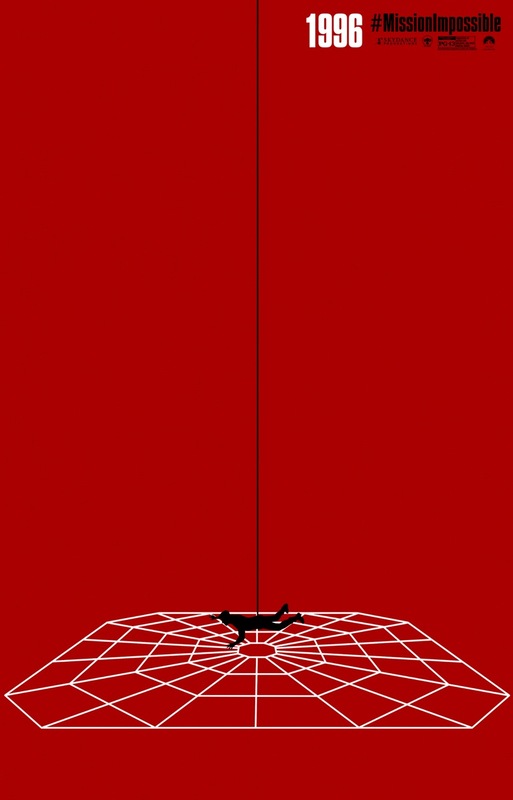 In Mission: Impossible, Brian De Palma crafted a pretty terrific spy film that manages to simultaneously embody and subvert many classic tropes of the genre. He didn’t limit himself to the tropes of the titular TV series alone, however, and for better or worse delivered a film that owes more overall to the classic spy films of Alfred Hitchcock and heist films of Jules Dassin. While that may rankle some dyed-in-the-wool fans of Bruce Geller’s series (and while I’ll personally never be able to fully get over the appalling treatment of the series lead Jim Phelps), what spy fan can resist classically canted angles of Prague streets at night, treffs in London safehouses, live drops on European trains, or intrigue at black tie embassy affairs? Not this one! Fashion Alert: One attribute Voight's Phelps shares with Graves is a fashion sense that dates somewhat poorly. It mostly comes through in his hair, which seems an odd length and cut for a secret agent. *NOC lists as MacGuffins are a personal pet peeve of mine. I can’t stand that trope. From Mission: Impossible to Skyfall to Atomic Blonde (all movies I thoroughly enjoy), the NOC list MacGuffin drives me nuts. Because once a list of active agents is out of the hands of the agency controlling them for even a minute, all those agents must be assumed blown. The damage is done in the mere theft or disappearance of such a list from safe hands. It’s toothpaste that can never be put back in the tube, and thus an ineffective MacGuffin. The only way the CIA can really protect its blown assets now is by doing whatever it can to warn them and exfiltrate them in a timely manner. And an object that becomes instantly useless when removed from its proper place fails as a MacGuffin. In Mission: Impossible, at least, the audience can be sure that the real NOC list is never compromised, because we’re always privy to its whereabouts and the ineffectiveness of any attempt to upload it elsewhere. But Kittridge and the CIA don’t have the benefit of our omniscient point of view.